Crystal Park is a gated mountain community located above and west of Colorado Springs and adjacent to Manitou Springs, Colorado. Our District consists of over 2,000 acres of wooded, mountainous terrain, with elevations that rise from just under 6,700 to almost 9,000 feet above sea level. There are approximately 230 homes scattered throughout the District. Crystal Park is organized as a PUD, with the common acreage being held by the Crystal Park Homeowners Association. It is surrounded by undeveloped forested land, most of which is public open space. The Crystal Park District is located in El Paso County within the USGS Manitou Springs Quadrangle. The approximate center point of the Park lies at 38o50’ N latitude and 104o55’ W longitude. It lies within the watersheds of Sutherland and Ruxton Creeks. 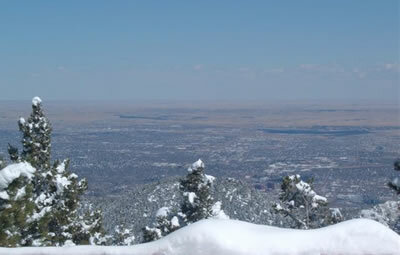 Crystal Park is surrounded by a combination of federal, county, city and privately owned land within Manitou Springs. It is bounded to the south and west by the Pike National Forest (PNF) with an area administered by the Bureau of Land Management along the northwest border. The Crystal Park Road provides the only access to this particular section of the PNF. To the north, forested areas and public open space along the southern edge of Manitou Springs merge with the Park boundary. 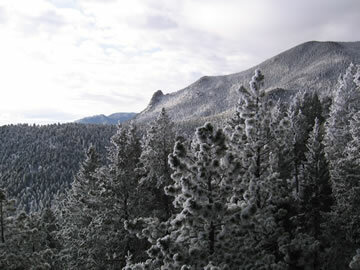 Directly to the east and somewhat southeast is public land belonging to Colorado Springs. Crystal Park consists of overgrown, fuel-dense forests and ground vegetation on challenging terrain coupled with limited access roads, all of which seriously hinders the ability to protect life, property and the community from wildfires. The Crystal Park Fire District precisely fits the definition of a Wildland Intermix Community: structures are scattered throughout a wildland area; there is no clear line of demarcation; wildland fuels are continuous outside of and within the developed area. As a fire district, it has oversight by the Crystal Park Metropolitan District which was organized in 1995 for the specific purpose of fire protection. In 2007, the Crystal Park Fire Department was organized in order to lower response times to medical emergencies and fire. CPFD has a mutual/automatic aid relationship with Manitou Springs Fire Department.